Microsoft launched Windows 10, their first major OS overhaul after over 3 whole years of the last release. For Windows old timers, Windows 10 brought a lot of improvements, and gave us all hope for the future. We got the new and innovative Start Menu, kind of a combo between the Windows 7’s classic layout and the Modern UI funkiness from Windows 8 and 8.1. But among all those changes was a pretty major new thing, the so called Project Spartan, now what we know as Microsoft Edge. Meet Microsoft Edge, the oh-so long awaited replacement for Microsoft’s ageing, and anemic Internet Explorer. It brings a whole array of new features, like taking notes and doodling on a live webpage, enhanced sharing features, revamped user experience to fit all three ecosystems, desktops, mobiles and tablets, to heavy hitters like a totally new web rendering engine, EdgeHTML, created on a fork of the Trident Engine. Microsoft also has been updating the browser with optimizations and newer security fixes quite consistently too. We can surely notice that Microsoft is not only trying to gain back the old time Internet Explorer fans, most of whom went over to Chrome or Firefox in frustration over the experience and speed of Internet Explorer, but also entice new Windows adopters into sticking with Microsoft Edge. But all the fancy stuff aside, does Microsoft Edge live up to its claims of being the best browser for Windows 10? Let’s find out! All drivers and software on both host and virtual machines have been updated to the newest revisions, and all background applications have been terminated. We have ensured that no bottlenecks have occurred in our testing, and have tried our level best to ensure an unbiased playing field for all the browsers in our testing process. For this comparison, we have chosen Microsoft Edge, Google Chrome, Mozilla Firefox and legacy Internet Explorer. We have also added Google Chrome and Apple Safari native performance under OSX, so you can get more idea about the performance metrics. HTML5 Test is a simple test designed to check if the browser supports certain classes of features and capabilities which HTML5 can handle. This test does not measure performance of those features, but merely whether it can support it or not. Here, Google Chrome sweeps the floor with everyone else. Microsoft Edge performs pretty well, scoring 402 out of 555, quite a bit better than Internet Explorer, but it’s nothing exceptional. 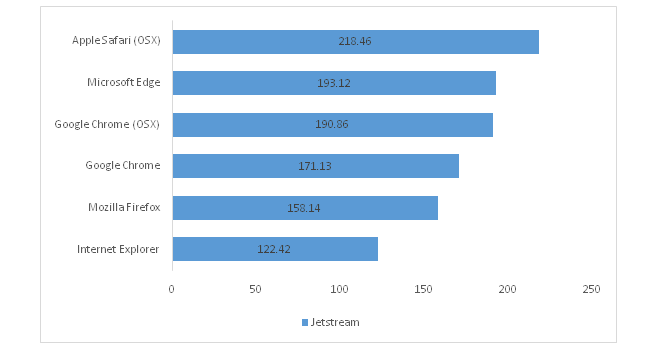 In Jetstream, Microsoft Edge puts in a very strong showing, beating out Google Chrome by a sizeable margin inside the VM, and by a fraction natively. We can clearly see how much improvement has gone into the new engine, as Edge performs nearly 60% better than Internet Explorer. The chart is dominated by Apple Safari, which beats out Edge by some margin. 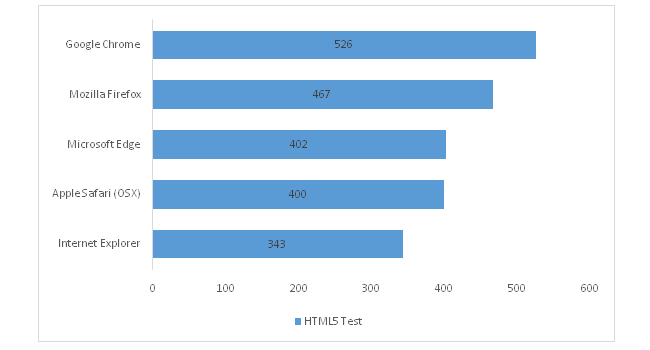 Here in Octane 2.0, we again see a very similar trend, with Microsoft Edge topping the testing chart, beaten only by Google Chrome on the Host machine. It even edges out Apple Safari on the Host machine, and totally sweeps Internet Explorer off, with a whopping 125% lead over it. 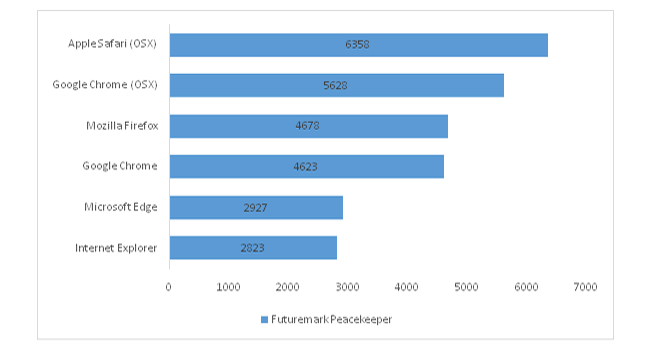 Futuremark Peacekeeper is a web benchmark suite from Futuremark, makers of the wildly popular PCMark benchmark tools. Peacekeeper is mostly oriented towards testing the graphical capabilities of the web engine, including HTML5, OpenGL, WebGL, online video and more. In this set, Microsoft Edge performs really badly, barely managing to cross Internet Explorer. It misses a lot of HTML5 capabilities, especially video formats like WebM and Theora. Google Chrome on Windows has nearly 58% lead over Edge, while Apple Safari holds a whopping 117% lead, pulling in a clean win. Microsoft Edge is a brand spanking new effort from Microsoft. It was built from scratch to be a part of Microsoft’s Universal app ecosystem. It has a new minimalistic UX, oriented towards putting focus on the content you are watching, than on the interface itself. 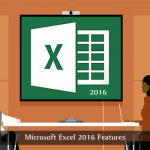 We clearly admit that Microsoft Edge is a really good browser, it has many innovative features up its sleeve, especially the web annotation and OneNote integration are great features to have. There is also a dark and light theme, a comprehensive Reading mode, Cortana integration. It also syncs well to other device if you are into the Microsoft ecosystem. 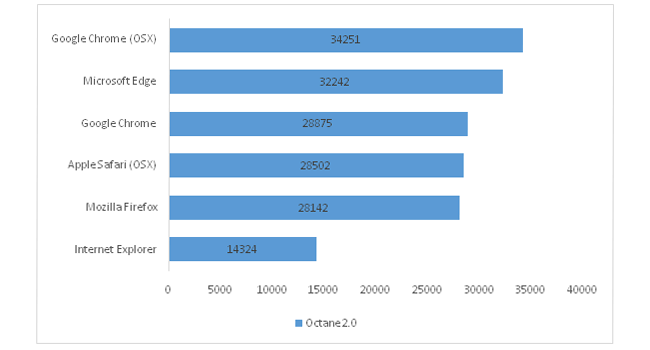 While Microsoft Edge is definitely a strong contender in the field, it is definitely a major improvement in performance over Internet Explorer, ranging from 3% in Futuremark Peacekeeper to a whopping 125% in Google Octane 2.0. For real world usage, Edge is a perfectly fine browser. Page loading is fast, scrolling and panning around are silky smooth and overall performance is commendable. A major omission, something you might actually miss, coming from Firefox or Chrome is extension support. It’s a real turn-off for those used to using extensions like AdBlock, PushBullet, Hola, Boomerang, Pocket and much more. Microsoft did state that it will be coming soon, but that soon hasn’t appeared yet. In our opinion, Microsoft still has ways to go before claiming that Microsoft Edge web browser should be your one and only internet companion on Windows. Really, there is nothing stopping you from using it, and yes, you won’t really be disappointed with Edge as your daily driver. But our focus is on the other crowd, the people looking to switch. We are sorry, but there is no reason for you guys to jump ship at the moment. Microsoft Edge web browser doesn’t offer any big advantage or discernable performance difference over Google Chrome or Mozilla Firefox. Plus, you get the added benefit that Chrome or Firefox are cross platform, coming in on Windows, Linux, Mac OSX, Android and even on iOS, so you can take your bookmarks and tabs on the go easily. 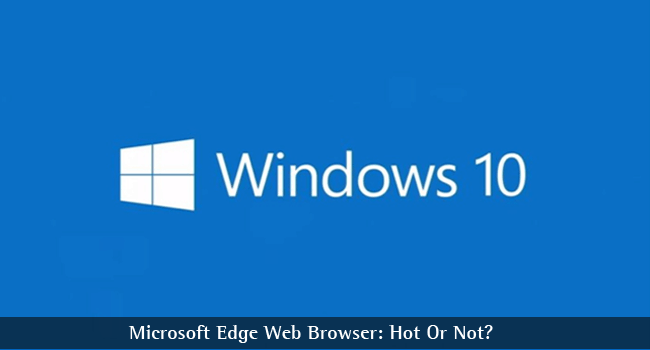 So, is the Microsoft Edge hot, or is it not? The answer is, yes, it is hot, with a ‘but’. There are still ways to go for Microsoft to create the perfect browser. However, we would still applaud Microsoft for the effort they put in, and it clearly paid off. Edge is a much better browser, much more comparable than Internet Explorer ever was. The think the Internet Explorer and Microsoft Edge browser are the same. Nope, they are not the same. Microsoft Edge is definitely better than Internet Explorer. I have also conducted a test for Chrome and Edge. 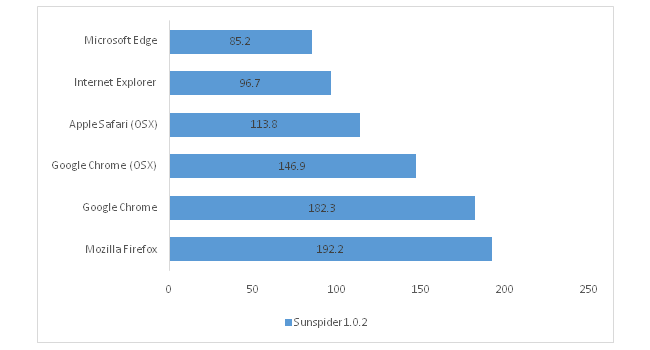 The benchmarks I opted were Futuremark Peacekeeper and HTML5. From the test I can say that even though Edge does not bit Chrome but it has really impressed me with its features. Hope Microsoft comes with some features such as extensions in Edge. I am using Edge browser in my Windows Phone, and it is yes much better than the IE, and other ones that are available for the platform. Some issues are missing, but yes its in beta and subsequent roll outs will cover them. Microsoft Edge seems to be good as comparison to Internet Explorer. But opening around 7-8 tabs starts showing issues. Microsoft Edge is much faster than internet explorer and window 10 operating system support all old and updated software, that is really awesome for us. I think it is a great broswer but does not have enough extensions.